Tommy Hilfiger has returned to his preppy roots with updated styling and a cool, new fragrance: Tommy Eau de Prep. It's all about the classic life with a twist and Prep has never looked so fresh. 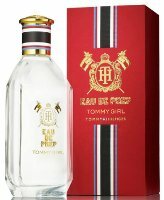 Tommy Girl Eau de Prep (shown) ~ "Tommy Eau de Prep for Her contains Pink Peppercorn, Violet Leaf, White Roses, and Sandalwood for a classic "Prep" feeling." Tommy Eau de Prep (blue bottle, not shown) ~ "The scent includes fragrance notes such as Grapefruit, Clary Sage, a splash of Tonic Water and Suede to convey a feeling of fresh, classic, sporty and preppy." Tommy Hilfiger Tommy Girl Eau de Prep and Tommy Eau de Prep are available in 30, 50 and 100 ml Eau de Toilette. it sounds ridiculous, but i do have to say that i appreciate their candor. Tommy Hilfiger Tommy Girl Eau De Prep is a women’s fragrance from Tommy Hilfiger going back to the roots of the brand Preppy. Tommy Girl cologne Prep is the accessory that looks as a long-term impression. Whether to leave the tennis court or at a posh charity gala. Tommy Girl cologne Prep is the striking, brilliant finishing touch to your outfit. Tommy Hilfiger Tommy Girl Eau De Prep opens with white roses followed by a colorful heart of Pink Pepper, Green Apple and Violet leaves. The base closes down the odor of musk. It sounds ridiculous to me too, but I guess that if it’s a style you like, maybe it doesn’t sound ridiculous? Gah. I had little interest/respect for Hilfiger when he rocketed to popularity in the mid nineties, and I have none whatsoever since “Loud.” I’ll be passing on this one. The Hilfiger perfumes have not, so far, really interested me, although Tommy Girl is well done. I do think they’re generally a good fit with the fashion though — they know their audience. Yes, I agree Robin. I really don’t care much for The Hilf either (especially after True Star fronted by Beyonce – horrible! just HORRIBLE!) But I do like and own Dreaming, that’s actually quite the step up. Shouldn’t this be Eau de Pep. Did Tommy even launch Loud in the US? You can buy them here (even through official channels, like the Hilfiger website), but I suspect they did not spend anything on the US launch (which was scheduled for spring 2011) after their performance in Europe. Hope someone else will chime in if they saw them in a department store — I never did. Does anyone know if it was effected by the documentary? I imagine they would have signed off big time in order for BBC to feature them that way, but do you think they’re pissed after being exposed as everything that’s ‘wrong’ with perfume these days? Maybe they are doing this to go back to who they are, and not be accused posing for the next young thing. I can see them saying, “Wait what are we? Oh yes, were preppy. Call it Eau De Preppy”. Very silly name but I guess we know for sure who his customer is now!